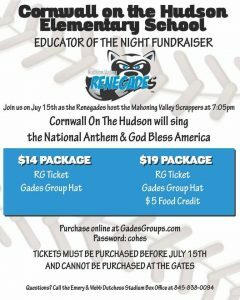 Our newly promoted 4th Graders will be singing the National Anthem and God Bless America (during the 7th Inning Stretch) at the July 15 Renegades game. Buy your tickets now!! Tickets must be purchased online at www.GadesGroups.com with the password cohes. You will be taken to a screen that shows the available seats in our section so we will all be sitting near each other. Also, one of our very own teachers will be throwing out the first pitch. Please share with all of your friends and family–anyone can purchase tickets and all are welcome!! 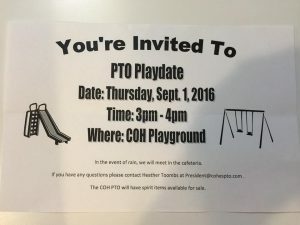 This entry was posted in Event, PTO announcement on June 12, 2017 by COH PTO. The COH Playground Project is a community initiative to build a safer, more inclusive, and more stimulating play environment for our children and our school. With the support of Assemblyman James Skoufis and Senator William Larkin, we have been able to raise nearly all the money we need to build this summer. Please come to our upcoming fundraiser and help us raise the remaining funds! Our Winter Social will be held at Palaia Winery on Friday, February 24th, 7-10pm. Visit us at www.facebook.com/COHplayground to purchase tickets ($100 per person) or make a general donation to the project (all donations are tax-exempt). You can also write a check to “COH Playground Project – CFOS” and mail it to 36 Grandview Ave, Cornwall-on-Hudson, NY 12520. If you have any questions or want to get involved, contact Rana Liebert or Christy Larkin at cohplayground@gmail.com. This entry was posted in Event, Fund Raiser, PTO announcement on February 3, 2017 by COH PTO. Father/Daughter Dance 2017, Friday, Feb 10th—Form and money due by Feb 3rd! Father/Daughter Dance will be held Friday, Feb 10th from 6:30-8:00 pm at the school. Girls are welcome to bring their Father or another special man in their life. Dress to Impress! Wear something with red to celebrate Valentine’s Day (optional). This event includes refreshments, a Corsage, one 5×7 portrait, games & unforgettable memories to bring home. Music provided by a D.J. Form is linked below. Please return the bottom slip with payment no later than Friday February 3rd. This entry was posted in Event, PTO announcement on January 29, 2017 by COH PTO. This entry was posted in Event on September 1, 2016 by COHES PTO.